You'll be £6.80 closer to your next £10.00 credit when you purchase Flight Craft 9: Avro Shackleton. What's this? Carefully researched, with a section for the modelling enthusiast. The Avro Shackleton, also known in the RAF as ‘40,000 rivets flying in close formation’ was very much a product of WWII that just took a long time to arrive. The authors have managed to do full justice to both the history of this important aircraft and to the scale model kits that have been produced to immortalise it. Recommended to all enthusiasts of aviation matters and to all model makers. ... their text does pretty well in documenting the type's development history, the differences between the marks and 'Phase' modification standards, camouflage and markings carried, squadron allocations, bases and dates. There are 16 pages of colour profiles, very well done with good colour balance. Photo coverage is, as promised, quite extensive, and includes a shot of MR2 WG557 with Royal Navy titling. ... The final couple of pages carry a set of useful colour photos of the interior details of the cockpit instrument panels, ideal for the modeller. Not mentioned in the book are the very new Eduard sets for the detailed cockpit instrument panels, and instrumentation for the detail in the fuselage work stations which are included in the new Airfix kit and will look even better with the pre-coloured panels in these new accessory sets. 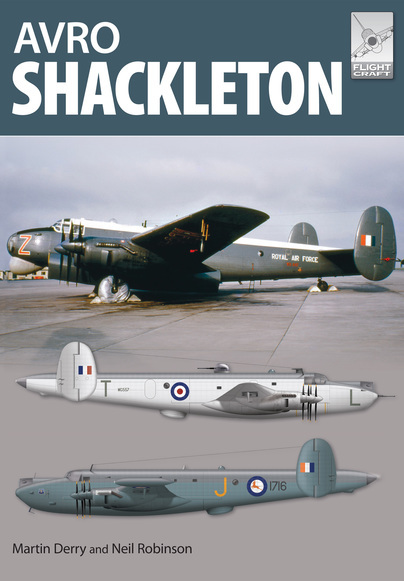 In the preface to this excellent volume the authors start by saying that the object of it '....is to offer as much visual coverage of the Avro Shackleton as possible within the confines of just 96 pages...', and I can immediately and unqualifiedly confirm that they have succeeded admirably in this task. Any modellers requiring a single-volume reference to enable them to construct a near-perfect replica of the aircraft need look no further than this book.